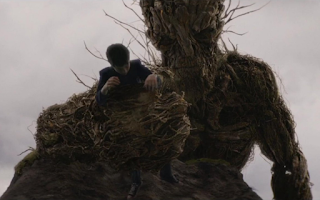 A very short review: "A Monster Calls" has incredible special effects, with a massive and jaw-droppingly realistic Yew tree creature that's like a more impressively convincing and genuinely frightening version of Groot (voiced in a rumbling baritone by Liam Neeson but looking more like a woody Hugh Laurie). He appears in the fantasies of a troubled schoolboy named Conor (Lewis MacDougall), whose single mother (Felicity Jones) is dying. His grandmother (Sigourney Weaver) must cope with Conor's frustrated acting-out and his mother's impending demise. The movie's mixture of nightmarish terrors and poignantly dramatic tragedy is unexpectedly effective. Its one notable flaw, however, is that it's one of those movies that didn't know where to end. After a perfect tearjerking conclusion, there's a final scene that very obviously should have been cut. Still, that's not enough to keep this interesting hybrid of storybook fable and domestic tragedy from being highly recommended.